emmatree: advent day 17: against a rainy sky. on, off, on, off. advent day 17: against a rainy sky. on, off, on, off. 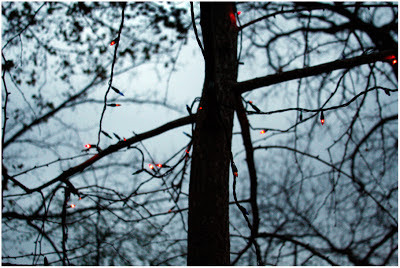 the tenderest of little twinkle lights, caught mid twinkle, late gray afternoon or early foggy morning, rain behind the clouds. their tinyness touches me somewhere near where my heart beats. Oh that we all be touched by the tiniest of light.